Rose—a timeless, nostalgic, and universally-appealing fragrance—evokes wonderful memories of long, warm summers in flower-filled gardens. This incredible fragrance is renowned for its association with love, making it the perfect scent to give to those you care for. 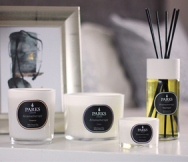 Captured in a blend of pure scents in a non-alcoholic natural base and contained in a stylish 200ml reed diffuser, this classic room scent is as wonderful to use as it is to give. Roses are often associated with idealism—perhaps because they are thought of as a sophisticated and highly-prized flower. Used extensively in aromatherapy, rose scent is every bit deserving of this association. This nurturing floral scent is said to restore balance and bring harmony due to its stimulating and uplifting properties. If you or someone close to you feels down, the intoxicating fragrance of this incredible flower can lift a heavy load and brighten your mood, creating a sense of wellbeing. Even modern scientists have investigated its benefits, with one study discovering that a combination of rose and lavender oil effectively reduce the symptoms of depression and lessen anxiety. Our perfume diffuser is presented in an attractive gift carton featuring our iconic branding—a symbol of luxury and quality. Gift it to a discerning friend in need of some pamper time or fill your home with the intense aroma of this addictively-fresh floral bouquet. Muse over the happiest of memories as the scent of this incredible flower brightens your mood and transforms your day.